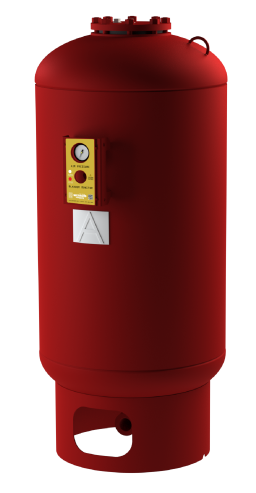 Wessels type NLA removable bladder expansion tanks are designed for use in hydronic heating/cooling systems to absorb the expansion force resulting from the changes in temperature of the heating/cooling fluid. They’ve been intelligently designed to include a WessView® bladder integrity monitor and integrated air-side pressure gauge. As the system fluid expands, it is forced into the precharged tank to the maximum system pressure. The precharged air cushion then forces the fluid back into the system as it contracts. The extra heavy butyl bladder keeps the fluid permanently isolated from the precharged air cushion. This arrangement eliminates water logging and absorption of air into the system. It also helps prevent air bound terminal units, excessive corrosion, inefficient balancing and pump cavitation over the life of the system. The large acceptance volume allows maximum storage and reduction of up to 80% in tank size. Energy consumption is reduced by eliminating unnecessary system water volume. For thermal installations use Wessels type TXA or TTA for potable hot water applications. Were you looking for a non-replaceable bladder tank?